I love that we have so many options for managing your period! Menstrual cups in particular now come in all shapes and sizes and are offered by so many different brands. I was so excited when the SELENACUP reached out to me because I love their products! Their cups are Austrian-quality and an innovative, comfortable and eco-friendly alternative to tampons and pads. The SelenaCup is made from medical-grade silicone – hypoallergenic and free from latex, dyes, perfumes, BPA, plastic, phtalates, bleaches and other toxins. The SELENACUP is convenient and easy to use. You can’t see it, you can’t feel it and if cared for correctly, it can be reused for many years – great both for the environment and your wallet. I love that they offer two different styles-one is standard and one is “aktiv” for women with stronger pelvic floors! Removal is simple with the ring at the bottom (one of the reasons I love this particular cup!). To remove the cup you have to release the seal first. I always recommend doing this for the first time in the shower or bathtub because it helps with the mess and also helps with relaxation (there won’t always be a mess, but those first few times when you’re getting the hang of things it’s not a bad idea). You release the seal by either hooking in one finger in the top or by squeezing the base of your SELENACUP with your index finger and thumb. It should come out without any effort. If you feel a resistance or ‘pull’, the seal has not been released. 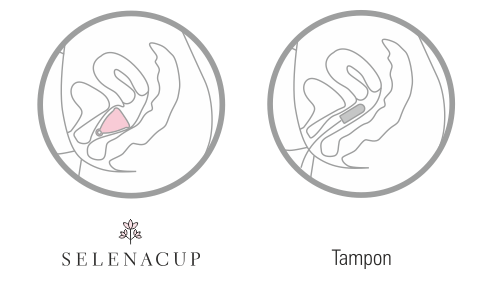 The suction required for a menstrual cup to work is one of the reasons they’re not recommended for IUD users. Menstrual cups provide up to 12 hours of safe protection and therefore do not need to be changed as frequently as a pad or tampon. Because they are reusable, they are significantly cheaper than pads or tampons. After 4 months, the purchase price is paid for and the cup can be used for several years when maintained properly. A cup does not cause vaginal dryness as it collects menstrual liquids rather than absorbing them. The sensitive vaginal flora remains in an equilibrium and is thus less prone to fungi and other bacterial infections. The cup is easy to use on lighter period days and can be inserted a few hours before the start of your period. By using the SELENACUP you dramatically reduce the monthly waste you produce and thus your impact on the environment. On the go and on your travels, you can avoid being unprepared when your period arrives as you can always carry a menstrual cup with you without having to dispose of it. There are less unpleasant odors with the use of a menstrual cup as the menstrual fluid does not leave the body like in the case of pads. The SELENACUP holds tight whilst swimming and thus does not allow the entry of germs and bacteria as is the case with tampons. Women have reported less menstrual cramping and discomfort through the use of the SELENACUP. Have questions about the SELENACUP? Check out their FAQ for more information! Have you tried a menstrual cup? What was your experience? This post sponsored in partnership with SELENACUP. All opinions are my own.